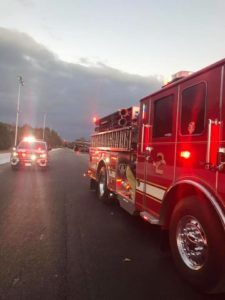 On Tuesday, December 4, 2018 at approximately 4:10 p.m., emergency medical services responded to Maryland International Raceway, located at 27861 Budds Creek Rd, Mechanicsville, for the reported injuries after a fall. Crews arrived on scene to find a 75 year-old male that fell approximately 30 feet off of scaffolding. The single patient was flown by Maryland State Police Helicopter Trooper 2 to an area trauma center with unknown injuries. Photo courtesy of Mechanicsville Volunteer Fire Department. This entry was posted on December 5, 2018 at 9:17 am and is filed under All News, County, Fire & Rescue, More News, St. Mary's News, z 600X120 Top Ad Bottom, z 600X120 Top Ad Top. You can follow any responses to this entry through the RSS 2.0 feed. That’s right, It was built on purpose! We are getting new score boards. He was installing. No racing.